When we think of Bangkok, one of the first things that springs to mind is: Traffic. Not the bright lights, the delicious cuisine or the colorful nightlife, but traffic. The hustle and bustle, the honking of horns and the rush hour congestion. While it certainly doesn’t take away from Bangkok’s irrefutable charm, it doesn’t do much for delivery services in Thailand. Fortunately for you, Deliveree makes delivery services in Thailand, simple. You don’t have to worry about whether or not your packages and deliveries will make it to their destination on time, because Deliveree has revolutionized the logistics and transportation industry. Using sophisticated technology, a revolutionary strategy and a fantastic, user-friendly mobile application; arranging your deliveries has never been easier. It’s easy! Simply type in Deliveree in the Apple or Google app stores and download it. Or alternatively you can try our handy web app from any internet browser. All you need to do is simply select your pick up and delivery destinations. You’ll be able to clearly see the number of available vehicles in the pickup area. In addition to that, you can add up to 10 destinations per booking for your convenience. You have complete control over your booking. So, you can select the relevant vehicle that you think is the most appropriate for the things you want to have moved. Next you can select the timing for your order. You can select from anywhere between 60 minutes and 4 weeks in advance! Did someone say fast & effective? That’s Deliveree! By this point, there’s nothing left for you to do. The rest is up to us. Our handy app will match you with the most appropriate driver in roughly one minute. You will have their contact details, get an ETA and able to track their progress. If you’ve requested an immediate pick up, they will head to you at their earliest possible convenience, meaning that they might make it to you even sooner than expected! What could be more convenient than being able to track your delivery in progress, in real time? With our handy app you can see exactly where your Deliveree driver is on the map and what their ETA is. In addition to being able to track your order, you can contact us at any time. You can either do this through a convenient chat option, or by calling out our customer hotline available 7 days a week from 7am to 10pm. We’re always here for you, whenever you need us. Your driver will arrive in good time and make your delivery without a hitch. Following that they will receive and send you a digital signature. Of course, if you have more than one delivery, they will send you a signature for each. Don’t forget to rate your driver afterwards! We love to provide the highest level of excellence, so it helps us track our driver’s customer service quality. A simplified service means that there’s one less thing for you to worry about. This is why we take great pride in our revolutionary delivery service. If you’re tired of stressing out about getting your products to your customers, then you should certainly give our services a try. We are confident that you will be entirely satisfied with the way that we work, getting from A to B in 123. Deliveree makes delivery services in Thailand simple with sophisticated technology, changing the logistics industry. 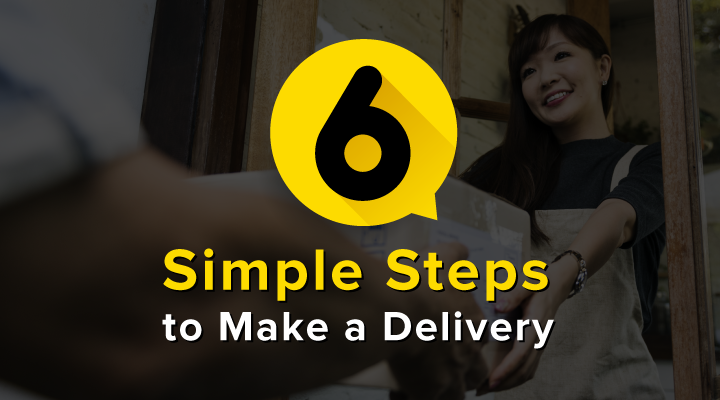 With only 6 steps, you can have your packages or deliveries done in the most affordable price.